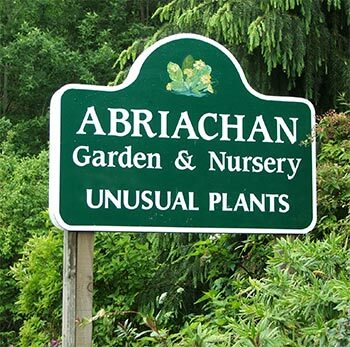 The first garden (and nursery) I visited in Scotland, Abriachan, had a secret and private feel, though it proudly had its own official brown open-garden road sign. Abriachan nestled on the hillside overlooking that famous stretch of Scottish water, Loch Ness. But I had much more fun peering into Abriachan's delightfully planted garden beds than parking by the loch trying to catch a glimpse of the Loch Ness Monster! The garden looked deceptively small from the entrance, and any visitor rudely looking for quantity over quality was politely reprimanded by the owner-gardener's sign: 'The garden is a lot bigger than it looks from here...' Well said! There were a series of terraces which work their way up the gully, with gently graded paths and moss covered rock walls. 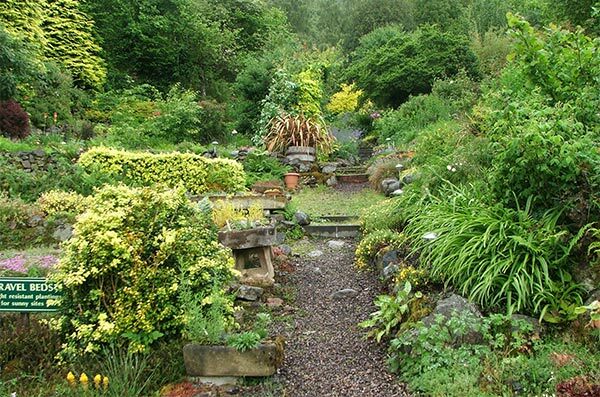 The garden was quietly expanding, and the further up it went the better the views of the plantings below - and the beautiful waters of Loch Ness. The gardener, self-styled 'tireless hero' Donald Davidson, explained in another sign how he created the new terraced beds. First the stone wall, then the shell was filled with dead plant matter, compost and soil. Once level, the new bed was left covered to 'heat up and rot down'. 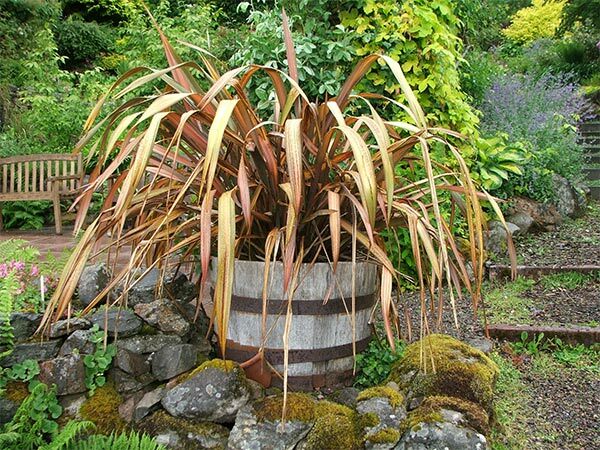 In Abriachan I met my first flax - a rusty red Phormium in a wine barrel. It was definitely true that Scottish gardeners could grow New Zealand natives, and I was to meet many, many more in my Highland travels. I found another reddish flax, afloat in a sea of ferns and flowers, and duly photographed it. It would be three or four gardens later that I became used to the flaxes and stopped this ridiculous habit! 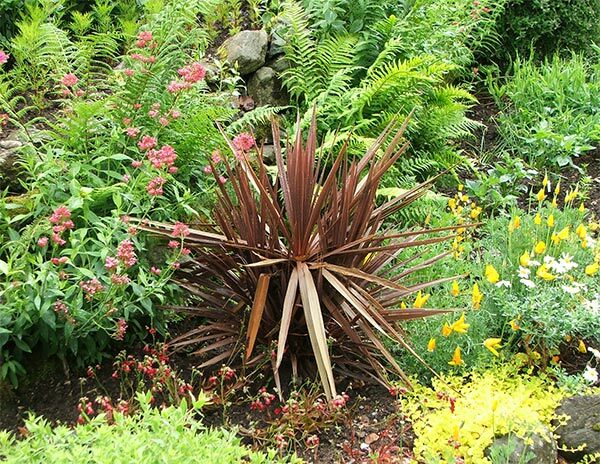 The terraced beds were crammed full of beautiful hostas, ferns, rhododendrons and other shrubs, beautiful foliage trees like maples, as well as my old friends - hebes, cordylines and phormiums. 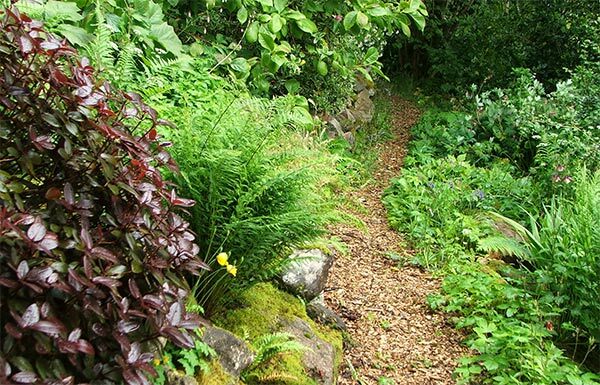 Sometimes cleared vegetation was left to lie and cover the newer paths - what a great idea. 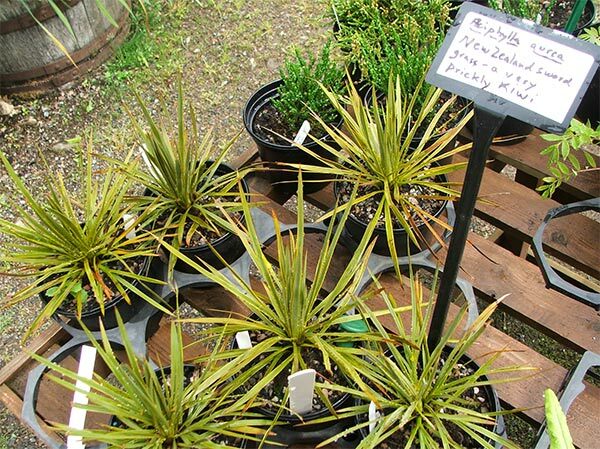 The nursery at the bottom of the property tried to entice me with a trayful of spiky Aciphyllas. These plants grow on our mountain slopes, and give sharp reminders to New Zealand hikers who brush too close. They are indeed, as the nursery sign says, prickly Kiwis. Screech! A brace of fighter jets swooped overhead, practising their low level flying. Neither the nursery-woman nor her friendly dog bothered to look up. I did - I got a real fright, and wanted to duck for cover. Aargh! Abriachan is owned and run by the Davidsons, with help from their friendly dog West. Forget the Loch Ness monster - this garden is much more exciting to visit. 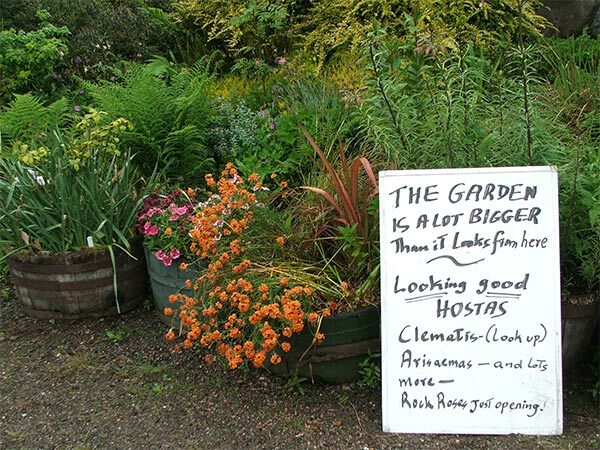 You can also check out the Abriachan web-site, which has beautiful photographs of the plants grown and sold in the nursery.